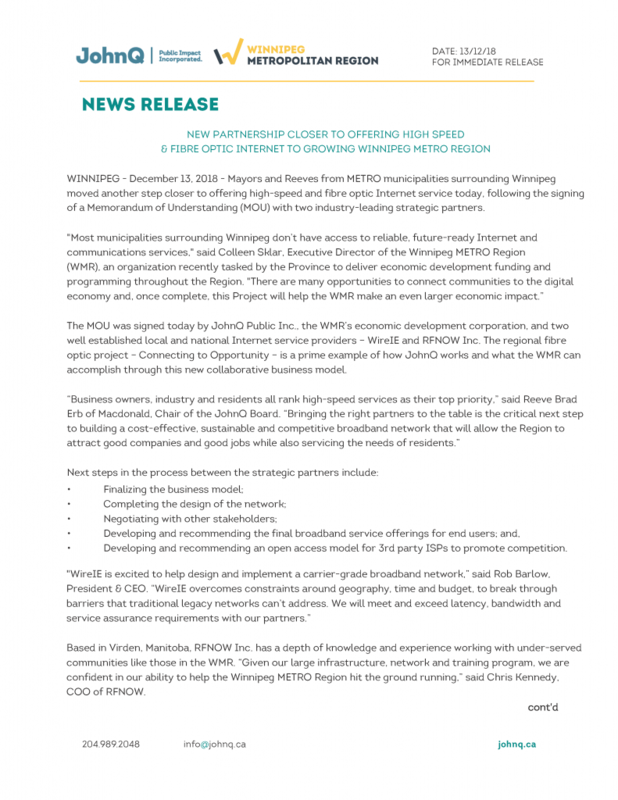 WINNIPEG – December 13, 2018 – Mayors and Reeves from METRO municipalities surrounding Winnipeg moved another step closer to offering high-speed and fibre optic Internet service today, following the signing of a Memorandum of Understanding (MOU) with two industry-leading strategic partners. The MOU was signed today by JohnQ Public Inc., the WMR’s economic development corporation, and two well established local and national Internet service providers – WireIE and RFNOW Inc. The regional fibre optic project – Connecting to Opportunity – is a prime example of how JohnQ works and what the WMR can accomplish through this new collaborative business model. Based in Virden, Manitoba, RFNOW Inc. has a depth of knowledge and experience working with under-served communities like those in the WMR. 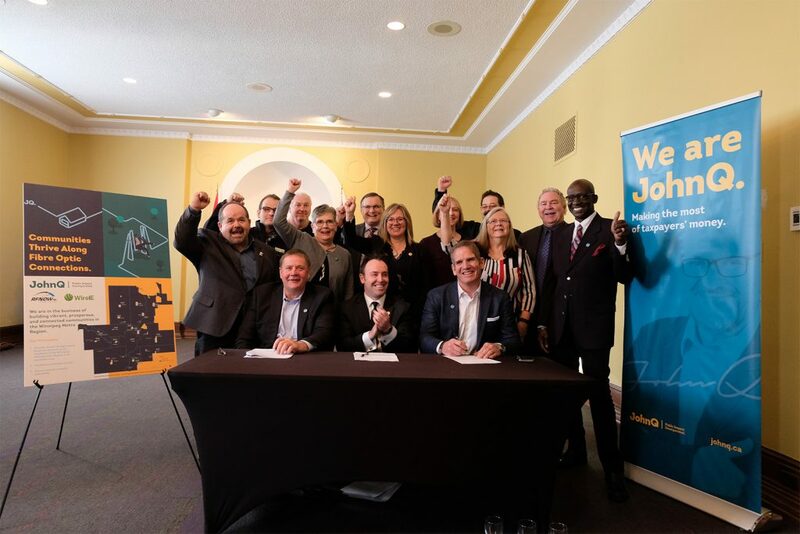 “Given our large infrastructure, network and training program, we are confident in our ability to help the Winnipeg METRO Region hit the ground running,” said Chris Kennedy, COO of RFNOW. For more information, see backgrounder attached. Rob Barlow, President & CEO – WireIE (Development) Inc.
Colleen Sklar – JohnQ Public Inc.
Chris Kennedy, Chief Operating Officer – RFNOW Inc.
Toronto, Canada – 15 May 2018 – One of Canada’s premier wholesale network operators today announced a new partnership designed to significantly enhance and improve broadband services for Indigenous communities across the country. WireIE, the nation’s industry leader in delivering high availability and secure data over networks in rural and remote regions, is teaming up with Frontline 360 Inc. to be the exclusive distributor of the company’s Internet Protocol TV (IPTV) platform for Indigenous communities and wholesale customers. 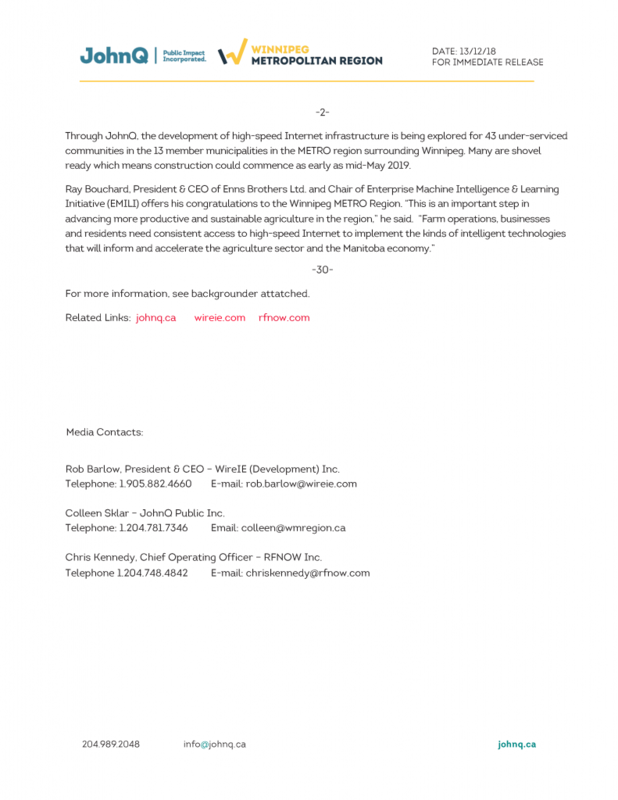 Toronto, Canada – March 7, 2018 – WireIE, a Canadian wholesale network operator specialized in the deployment of MEF-Certified Carrier Ethernet networks to Canada’s underserved markets, is partnering with W Dusk Group, an Indigenous-owned technology company, to deliver environmentally-friendly, enhanced fiber network solutions to underserved Canadian enterprises and communities. Underserved communities in Canada often face a situation of poor (or no) Internet coverage, which is exacerbated by a lack of reliable electrical energy. Through this first-of-its-kind partnership in Canada, the two companies will work with these communities, including First Nations, to mesh alternative energy technology with WireIE’s high-availability network solutions. The goal is to ensure individuals living and working in underserved areas avoid unplanned, costly downtime. Internet access has been formally recognized by the Canadian Radio and Television Corporation (CRTC) as an important tool for fostering economic development in areas that are not served by Canada’s major telecom carriers. WireIE is strengthening its legacy of providing the low latency and reliability needed to support the socio-economic development of businesses and communities in remote environments. At PTC’18, one of the most important telecommunications events for the Pacific Rim, our CEO, Rob Barlow, met up with JSA TV’s Jaymie Scotto Cutaia to discuss the company’s latest developments and where it is headed for the rest of 2018. Overall, throughout 2017, WireIE experienced continuous growth providing leading-class high-speed network solutions in underserved markets in Canada and around the world. We bolstered our reputation as an expert in underserved connectivity by consistently exceeding our network performance and reliability objectives throughout the year. For 2018, we are maintaining our focus on making it possible for individuals and enterprises in underserved areas to take full advantage of the digital economy. By using both fiber and microwave technologies in the delivery of high-availability networks, we are a partner of choice for industry and governments in need of reliable, secure connectivity for their mission-critical applications. WireIE prides itself on its ability to extend carrier networks to remote and hard to reach locations, bringing the metropolitan broadband experience to the underserved and promoting regional economic development. To keep abreast of new developments, follow us on Twitter and LinkedIn! Canada’s defence sector faces unique threats and challenges. From the growing number of cyber-attacks on the federal government to the country’s vast underserved regions, mission-critical government services across the country require networks with unparalleled resilience, availability and security. As a wholesale network operator specialized in the deployment of MEF Certified Carrier Ethernet networks, WireIE is the provider of choice for mission-critical underserved network requirements. In 2007, Rob Barlow created WireIE because he saw a gap in bringing high-availability network services to underserved markets where government assets and large enterprises need to function with the speed and reliability of those in major Canadian cities. The company addresses this need by working with its partners to deliver networks with unparalleled availability and ultra-low latency to enterprises and government installations of all sizes across Canada’s underserved regions. WireIE’s MEF Certified Ethernet 2.0 certification gives its customers performance assurance that their applications and network data will run without interruption and to the highest standards of performance. In 2016, WireIE worked with Tier 1 Canadian partners to replace the legacy service at a major NAV Canada radar station on Mt. Wallensteen, located 20 kilometres west of Salmon Arm, British Columbia. WireIE was the partner of choice since the station site is located two kilometers above the nearby community and is inaccessible during the harsh winter months. As a result, it was uneconomical to complete the upgrades using fiber technology. Even though the site could only be accessed via helicopter, WireIE successfully completed the installation of 10Mbps Ethernet service, exceeding the client’s expectations. The new network infrastructure provides the station with the redundancy and reliability necessary to ensure safe plane-to-ground voice communication for the many trans-Pacific flights coming into Canada on a daily basis. This year, the Canadian Security Intelligence Service (CSIS) reported that the federal government faces serious cyber-attacks on a daily basis. As the capabilities of state-sponsored hackers and terrorist groups increase, secure networks for government assets in underserved regions become a high priority. The reliable and trusted service that WireIE delivers can be used for all types of assets that are crucial to the security of Canadians. Already working on behalf of fourteen government departments, WireIE is excited to offer its innovative, best-in-class services in support of the Canadian defence sector’s needs. For more information on WireIE’s services, visit their resource centre here. Cybersecurity is an issue that can affect us all, but did you know that it’s impacting the oil and gas industry as well? The truth is, most oil and gas companies have already experienced a security breach to their system. In the past year alone, nearly 70 percent of oil and gas organizations have endured security compromises, resulting in exposed confidential information and disrupted operational technology. What’s worse, nearly 46 percent of all cyber-attacks in the OT environment go undetected. With the oil and gas industry in need of a robust cybersecurity solution, WireIE introduced its Nomadic Enhanced Fiber which is an MEF CE 2.0 Certified Carrier Grade Network. Recognized by multiple award programs for its quality, reliability and innovation, WireIE’s MEF Certified Network has become essential in providing solutions to the unique challenges faced by the oil and gas industry today. WireIE’s private oilfield network supports real-time commercial applications in challenging geographic environments where satellite and cellular simply cannot, eliminating network vulnerability. By providing comprehensive managed services that are tailored and integrated with characteristics of oil and gas operations, WireIE has created solutions to support existing, new and emerging demands as they evolve, leaving limited availability for hackers to breach the network. So, how does WireIE turn the promise of the digital oilfield into a reality? WireIE specializes in building and operating next-generation network infrastructures needed to support key real-time commercial applications for businesses operating in remote and challenging geographies, such as regions in South America. By using skilled local field technicians, WireIE provides its partners with the overall expertise to configure and deploy the digital infrastructure necessary to keep critical data secure. For the first time, the whole enterprise – from the head office, to the extraction sites, to various remote field locations – can drive optimum productivity, efficiency and safety throughout the digital oilfield. Companies can now confidently deploy essential data and applications which can be utilized and supported by an infrastructure that operates with speed, security and consistency, and which is underwritten by a contractually assured level of service. WireIE is unique, and with its digital oilfield solution, the oil and gas industry can now rest easy knowing that their networks are secure and that they can benefit from safer operations. No other company does more than WireIE to ensure access to your strategically critical data, wherever your operations may be. To find out more about WireIE’s state-of-the-art, SLA backed, digital oilfield solution, contact jsa_wireie@Jaymiescotto.com today. TORONTO, ON–(May 25, 2017) – WireIE, a wholesale network operator specialized in the deployment of MEF-Certified Carrier Ethernet networks to Canada’s underserved markets, continues to expand its digital oil and gas telecommunications network management expertise in South America. WireIE is operating in the Argentinian Bajada de Anelo gas shale field within the larger Vaca Muerta area. Using skilled local field technicians, WireIE is providing its partners with the overall expertise to configure and deploy the digital infrastructure necessary for project success. WireIE’s Day 2 service targets oil and gas producers who operate in increasingly remote and challenging locations, where it is difficult to staff project sites with skilled workers. Keeping the communications network up and running in the field can save companies thousands of dollars a day. As the responsible authority for its clients on the digital aspects of project, problem and incident management, WireIE lowers the risk of unplanned downtime and allows for greater efficiency in production. Having calculated a need for a total long-term investment of US $200 billion to reverse its sustained energy crisis, the Argentinian government is encouraging foreign investment in its Vaca Muerta shale fields. TORONTO, ON – November 15, 2016 – WireIE, a wholesale network operator specialized in the deployment of MEF-Certified Carrier Ethernet networks to Canada’s underserved markets, has been honored with the Capacity Global Carrier Awards’ Best North American Project. WireIE received the award for its unique nomadic solution, which combines innovative technology and management processes to address the need for MEF-certified, carrier-grade Ethernet in underserved markets internationally. WireIE is known for being a leading partner to Canadian carriers, helping them migrate off of the legacy technology commonly found in underserved, hard to reach regions of Canada. Large enterprises in these underserved geographies, whether in Canada or abroad, often face challenges when trying to leverage connectivity due to legacy technology or a lack of technology all together. WireIE delivers high-quality network services in order to assist enterprise verticals, such as oil and gas, and telecom service providers in delivering mission critical business applications in these previously underserved regions. WireIE’s solutions make the use of critical, real-time applications for voice and data possible, which eliminates the communications divide between office and the field. Companies utilizing WireIE’s nomadic solution experience enhanced efficiency, lower costs and the ability to leverage opportunities that were previously not attainable. The Capacity Global Carrier Awards recognize companies’ innovation, excellence and vision, setting the benchmark for performance throughout the global wholesale telecoms marketplace. The program has grown to be recognized as the largest and most prestigious awards in the wholesale telecom industry. This year a record number of over 200 entries were submitted and the winners were determined by a panel of 20 judges comprised of leading analysts, industry experts and Capacity Media’s senior editorial team. The winners were announced at the 11th Global Carrier Awards 2016 on Tuesday, November 8 in Paris, France. TORONTO, ON – November 3, 2016 – WireIE, a wholesale network operator specialized in the deployment of MEF-Certified Carrier Ethernet networks to Canada’s underserved markets, announces it has been listed as a finalist for the 2016 MEF Excellence Awards. WireIE’s innovative MEF CE 2.0 E certified nomadic Ethernet solution has led to its recognition as a Service Provider Awards Finalist. The awards recognize leadership in the development and delivery of global, regional, retail, and wholesale Third Network/Carrier Ethernet services, as well as excellence in service innovation, service orchestration, marketing, and network modernization. The winners of MEF’s 2016 Excellence Awards will be announced on November 8 at the MEF Excellence Awards Dinner. WireIE’s unique, fully-managed, terrestrial based nomadic Ethernet solution addresses the total cost of ownership challenge faced by large enterprises where assets are not in a fixed location. The solution is developed to deliver secure, phased delivery of fully managed Carrier-grade networks that enable the use of real-time, mission critical business applications in challenging geographic environments previously only served by legacy technologies, such as satellite and cellular. The low latency, high reliability connectivity unleashes the power of enterprises to conquer things they didn’t believe possible prior to deploying WireIE’s nomadic service. Although designed to address an issue faced by resource-based enterprises, the solution is equally beneficial to wholesale telecom providers wishing to access previously inaccessible verticals and markets. WireIE offers its nomadic Ethernet solution as a wholesale offering to carrier partners seeking to improve upon existing services by providing cost effective, reliable and efficient solutions to underserved and isolated geographies globally.